Our valued staff are industry professionals who are fanatical about safety. When they come to your site you can relax and be assured they’ve got your back covered. And we’ve got theirs covered with full 24/7 support, regular onsite training and site audits to ensure they are meeting our high standards. We work during the day, at night or at weekends. You decide what timing is going to cause the least disruption for what you need to do, and we can be there 24/7. Give us a call. If you’re interested in working for us, please see our careers page. If you are doing anything that requires temporary signs or cones, we have the equipment you need. We have a large supply of authorised traffic management equipment available for hire. 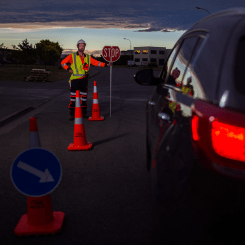 You are welcome to hire directly from our sites in Ashburton or Christchurch, we can deliver or setup your site for you in accordance with an approved Traffic Management Plan. If we haven’t got it – ask us. You never know what we can make happen. If you would like to buy some road signs or require a custom sign for a specific site give us a call. Our graphics division does all of that. We can even arrange delivery if that’s easier for you. All traffic signs used on the road must be authorised by the relevant road controlling authority. The legal requirements for traffic signs are given in the Land Transport Rule (Traffic Control Devices 2004). All roads requiring traffic control are designed to be either Level 1 or Level 2, depending on traffic loads. Spray Marks Traffic has been diverting traffic since July 2003 and has grown to become one of the leading operators in our field. We have a range of electronic traffic equipment available to hire. You can collect from us at which time we’ll provide you with all the training you need to operate the equipment. Or we can travel to your site and set it up for you so you don’t need to worry about it. We provide council-approved traffic management plans. If you’re doing work on or near the roadside, even if you’re just moving your cows, chances are you’ll need a local council approved Traffic Management Plan. Give us a call to discuss and we’ll advise you if you need one, prepare one if you do and submit it to the council for you. Once approved, the council will send it back to us and we can get things organised for you. You can concentrate on digging your trench or rounding up your cows. It’s one less thing for you to worry about. Easy. 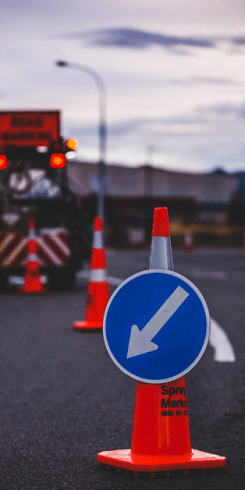 Our traffic management planners have years of experience and will design a setup that meets the goals of any traffic management job – ease and efficiency of work to minimise your cost while keeping the public and your staff safe onsite. 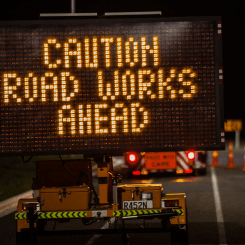 To become qualified to work on the New Zealand roads, you must attend and pass an NZTA approved training course. Spray Marks Traffic provide NZTA approved training courses for internal staff and external customers. Two day course which teaches how to prepare and submit Traffic Management plans, which signs to use for which applications, the rules and regulations and how to set up sites. We have fully equipped training rooms in Christchurch and Ashburton or can provide training at your site if you have several people that require training. We also hold STMS refresher courses. Call us to discuss.